Went for a quick spin this afternoon on the Gussy with the Qball and cleaned every climb on the Brody Road, including the steepest one. Decided to put a tag at the start of the Gussy Trail from the Brody Road because the last two riders who rode the trail said they weren't sure where the starting point was. Now I think it's pretty clear - just look for the tree with the yellow spot and the two green ribbons tied to it. Hopefully, no one will mess the ribbons. At the fir up-and-over, it appears that someone may have taken it upon themselves to divide the run up to the stunt by going to the right of the tree (in the picture below) when I had it going around that tree. Looking at it again, this made much more sense so I clipped some branches and opened it up some more. There was some fresh blow downs blocking the trail that I cleared out of the way. 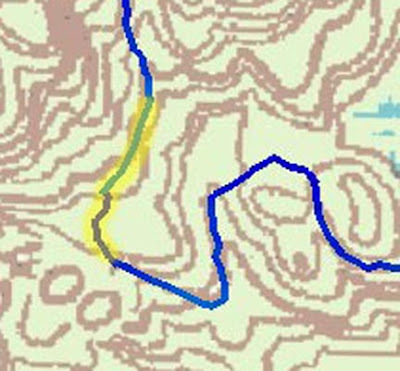 The yellow on the blow up of the map below highlight's two things, the sequence of pictures following this image and the trail clearing that I did this evening. Seems Rich Coffey took it upon himself to add some improvements through here and I really like them. So, I got out my portable clippers and cleared the new path. It's twisty and a little technical but the big wheels of the Qball handled it easily. After the clearing work and the photo op session, I jumped back on the Qball pedaled all the way to the first stream crossing. Just need one or two flat rocks there and a little benching and that crossing will be a no brainer. 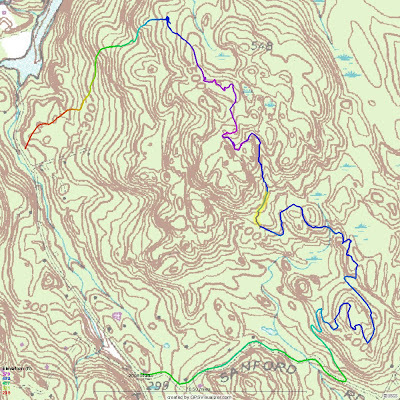 From there I hammered all the way to hairpin turn before traverse near the vernal pool overlook. Without stopping I pedaled all the way to the EEDR point that was no longer there and I was amazed how the Qball rolled through the rock garden/wet spot crossing. Without stopping, I just rounded the corner, picked a line and went for broke and the bike just sailed right through! Someone else riding the Gussy? Where are these trails at? Bike Parts Swap Meet in May? Look what a Dremel can do! Cannondale SM-600 on the Clist! Ride Hard, and Ride Prosperous!